Convicted former President Mohamed Nasheed has admitted that the arbitrary detention of the then Chief Judge of the Criminal Court, Abdulla Mohamed, during his presidency which had eventually landed Nasheed in jail, was not “the best thing to do”. He went on to assert that he had had Judge Abdulla Mohamed arrested due to the judge’s refusal to adhere to the decisions of the Judicial Service Commission (JSC). In his talk, Nasheed noted that the Maldives is still fairly new to the Constitution and the Separation of Powers, which he claimed to be the reason for past judicial judgments that the majority of the public did not agree with. “I don’t now feel that removing judges or changing the personalities will necessarily reform or improve the system. We must keep on plying the system, keep it in operation, as much as we can. I feel that once they are given a free hand and if you don’t interfere with their judgments, they will come out with reasonable judgments." He also accused the current government of influencing the Supreme Court, due to the majority of the apex court judges whom he said believe that the administration is in the wrong by ousting ruling party parliamentarians that recently defected from the party. Further, the former president said that the opposition’s staggering success in the Local Council Elections held earlier this year was a “pleasant surprise”, noting that the elections had been delayed thrice. Nasheed said that, under the circumstances, there is a possibility that incumbent President Abdulla Yameen, whom Nasheed and the joint opposition are seeking to impeach in Parliament, may not hold the Presidential Elections next year which he described would be a very dangerous situation. Moreover, he hinted that the opposition may not prosecute President Yameen should he step down, further hinting that the president may be given the opportunity to flee the Maldives. 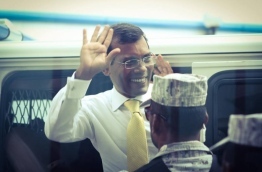 Former President Nasheed is on his first trip to India since he was sentenced to jail over the judge’s arrest and subsequently fled the Maldives to the United Kingdom after he was permitted to the leave the Maldives for medical treatment in January 2016. 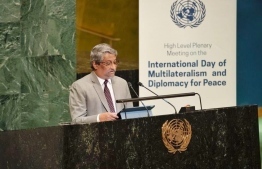 He has not returned to the Maldives since, though he has made multiple visits to neighbouring Sri Lanka to hold discussions with opposition officials and foreign diplomats. 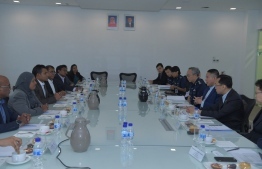 He is also currently facing a second terrorism charge over the arbitrary detention of incumbent President Abdulla Yameen Abdul Gayoom during Nasheed's regime in June 2010.